We've lways been fans of the image quality of Swann range of surveillance cameras both the cabled and IP varieties. One thing that has let their IP/Networked cameras down in the past has been a complexity of set-up which has required quite a bit of technical knowledge beyond a mere mortal. The SwannCloud range sets out to get beyond this latter restriction. Once you have signed up for a SwannCloud account then either on your PC or an app on your Smartphone you can easilly generate a QR Code that contains all the necessary information to set up the camera on your network. Just switch the camera on and point it at the code and hey presto -its all set up. 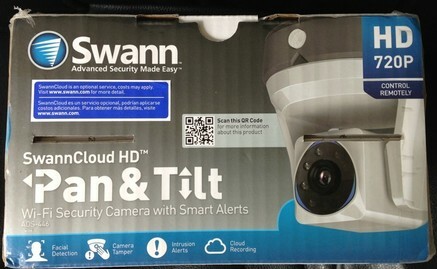 You can then immediately access the camera's image and control pan and tilt through the online Swann Cloud system and its apps- this does require internet access where the camera is connected. You can also set up the service to trigger alerts on movement, sound or even facial recognition. Its very powerful stuff. The image quality is as expected with the 720p camera perfoming well in both day and nighttime conditions. Why then if it is so good have we held off including this review. Basically we didn't want to include something with hidden costs. To get the best of the SwannCloud system you need to siggn up for a monthly subscription and untill recently there was nothing on the packaging to warn you of this. Swann have now changed this and each box carries a warning sticker and I'm told new packaging with a clear message is forthcoming. Overall this is a great security camera but we would advise checking Swann's website for costs to see if they suit your needs before purchasing. It is possible to get some use on the free service layer but we cannot see that suiting many people. Having said that if the costs seem reasonable you will get a camera that is really easy to set up (something we think should be standard on all IP cameras) and has great image quality.